I do not believe you have it if your heart is not thankful for it. “Blessed be the God and Father of our Lord Jesus Christ, which according to his abundant mercy hath begotten us again unto a lively hope….. to an inheritance incorruptible, and undefiled, and that fadeth not away” (1 Peter 1:3-4). Do you have heaven in hope? It is more than if the whole world were in your hand. Earth’s greatest king would be glad to change his crown for your helmet at his dying hour. His crown will not get him this helmet, but your helmet will bring you a crown, a crown not of gold, but of glory, which once on will never be taken off. Remember, Christian, it has not been long since you had only a fearful expectation of hell instead of a hope of salvation. But God took away the chains of guilt which weighed your soul down in despair and gave you favor in His celestial court. Of all men in the world, you are the most indebted to God’s mercy. If you thank Him for crust and rags – food and clothing – how much more should thank Him for your crown? After you have praised Him with your spirit, you should collect the praises to God of your friends too – and then, in heaven, continue thanking Him throughout eternity for your helmet of salvation. It will be a debt you will never be able fully to pay. Live up to your hopes. Let there be a suitable agreement between your principles and your practices – your hope of heaven and your walk on earth. As you look for salvation, walk the way your eye is looking. If the Christian fails to walk in the worthiness of his calling, he betrays God’s hope for him. And the Word emphasizes the necessity of this walk. It stirs up to act “as becometh saints” (Romans 16:2) and as “it becometh the gospel of Christ” (Philippians 1:27). – Taken from The Christian in Complete Armour, November 23. Edited by James S. Bell, Jr. Moody 1Publishers Edition, 1994. We still look forward to getting coffee in the mail. It’s like getting a birthday or Christmas present and opening the package. We like to squeeze the bag and smell the aroma. Then we like to open the bag and look at the beans and move them around a little and smell the aroma again. We thought they had a little bit of a chocolate aroma. Kim likes to taste a bean to get some of the flavor. She thought the dark bean in this blend was bittersweet and the light bean had a little spice and herb flavor. 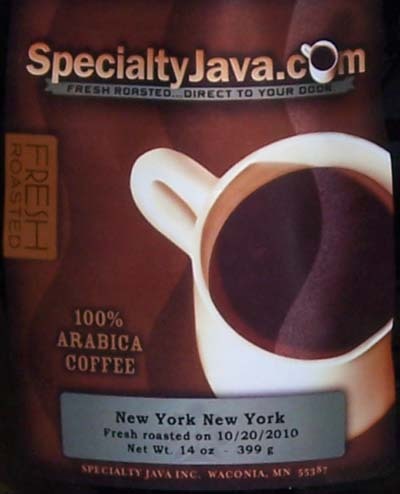 After all of that we were looking forward to trying this New York New York Blend from Specialty Java (www.specialtyjava.com). It is described as a medium-dark roast combining SHB Central American, South American and Indonesian beans to create a truly unique, high impact cup. They also put the roast date on the package which we appreciate. This helps you to know how fresh the coffee is and this coffee was fresh when we received it. First up was the auto-drip and there is a nice aroma from the brewed coffee. We like to use the auto-drip for reviews and convenience because the majority of coffee drinkers only use an auto-drip. It has a good dark color in the pot. It has somewhat of a bright, tart aftertaste and a medium body. We were looking forward to having more of this coffee. Next up was the French Press and the ground beans have a good aroma. It seems to have a darker earthy taste and slightly fuller body. The aftertaste seems to hit the front half of the tongue and the roof of the mouth. With each sip you want a little more. The third brewer we used was the Chemex coffee maker and here the distinct flavors of this blend came out. There was a mildly sweet aroma as we poured the dark coffee into our cups. The flavor seems to hit the tip of the tongue and then roll over the sides leaving you with an earthy, slightly smoky taste. The bright tart finish was very pleasing. This was a very enjoyable cup of coffee. Kim thought it paired well with chocolate and good with lemon, cinnamon peanuts and dates. It was o.k. with vanilla and almonds. This New York New York Blend was good in the morning and afternoon and with desert. It is a good all around coffee that everyone enjoyed drinking. 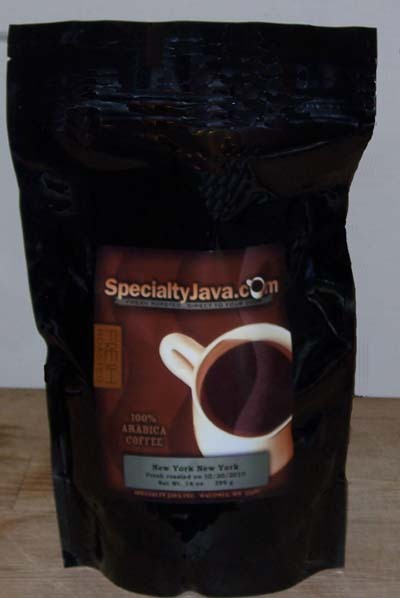 If you are looking for a new roaster to try during the holidays we encourage you to try this New York New York Blend from Specialty Java. We think you will enjoy it. We received this coffee for free and offer objective feedback. Until next time remember to stop and enjoy the coffee and conversations. I started to tell you about our trip to the West Side Market. If you are ever in or near Cleveland, Ohio it is well worth your time to stop there. The Café Volio coffee shop is tucked in the produce section of the market. We met one of the representatives of Café Volio and talked with him. They only roast and sell Costa Rican coffee. They have been in business since 1938 and you can learn more about them at: www.cafevolio.com. At their stand they have a little machine and they give away free samples. Let me tell you that coffee is good, real good. It was a cool day and that little cup of coffee started our visit at the market in a good way. We were drinking the Founder’s Blend and it comes in both whole bean and ground. It is a medium-dark roast with a deep dark color. Our first brew was in the auto-drip. There is a deep dark color to this coffee, but it is not over roasted. It has a smooth taste with some bittersweet chocolate undertones. There’s also a hint of tartness. We then tried the coffee brewed in the Chemex coffee maker. You see this deep dark color and yet the aroma is somewhat mild. It has a smooth, full body and it tasted bright on the sides of the tongue and the front of the palette. Along with the bittersweet chocolate we thought we noticed a little spiciness too. The French Press was up last and the bittersweet flavor stands out. The color of the brewed coffee is so dark that we were surprised at how smooth it tasted. The mixture of bittersweet chocolate, spices and tartness is a very good combination. Kim thought it paired well with chocolate, vanilla and cinnamon. If you have read any of our reviews you know we like to share coffee with our friends. Sometimes we give beans away and sometimes we grind the beans and give the ground coffee away. Other times we have friends over to drink coffee and sometimes we take coffee and a brewer to a party to share it. Usually we ask friends if they would like to take some coffee home. Each of our friends that tried this coffee liked it. If you have never tried Costa Rican coffee before or want to try a different coffee we suggest you try the Founder’s Blend from Café Volio. We think you will like it. We received this coffee for free and offer objective feedback. Until next time, remember to stop and enjoy the coffee and conversations. God sets some men on the high places of the earth and appoints them to exciting challenges. But He orders others to pitch their tents on lower ground and not be ashamed of their assignment, no matter how inferior it seems. Now to encourage every Christian to be faithful in his particular place, God has made promises which apply to them all. And His promises are like the beams of the sun: they shine as freely though the window of the poor man’s cottage as through the prince’s palace. God’s promises strengthen our hands and hearts against the discouragement that is most likely to weaken us in His service. They support and guard us against the furious opposition of an angry world: “I will not fail thee, nor forsake thee. Be strong and of a good courage” (Joshua 1:5-6). This was a promise God gave to Israel’s chief magistrate. And the minister’s promise agrees with it, having generally the same trials, enemies, and discouragements: “Go ye therefore, and teach all nations…… and lo, I am with you always, even unto the end of the world” (Matthew 28:19-20). The temptation which usually troubles those in lower callings is envy to see themselves on the floor and their brothers elevated to higher service. Sometimes these temptations produce dejection when the believers feel like eunuchs who bring no glory to God, dry trees which are unprofitable in His kingdom. To arm the Christian against discontent and discouragement, God promises as a great a reward for faithfulness in the most menial service as He gives in more honorable service. Is anything more degrading than the role of a slave? Yet nothing less than heaven itself is promised to the faithful servant: “Whatsoever ye do, do it heartily, as to the Lord, and not unto men; knowing that of the Lord ye shall receive the reward of the inheritance: for ye serve the Lord Christ” (Colossians 3:23-24). – Taken from The Christian in Complete Armour, November 16. Edited by James S. Bell, Jr. Moody Publishers Edition, 1994. We have been doing some traveling and have been able to try some pretty good coffee and visit some good coffee shops. Trying new coffee and visiting new shops doesn’t get old for us. 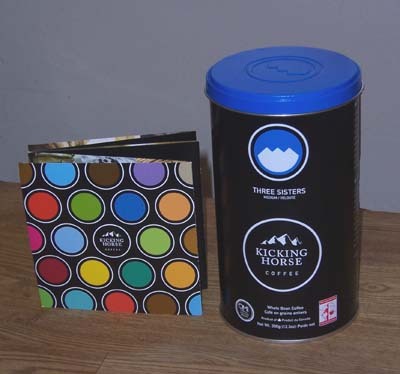 We were looking forward to trying this Three Sisters Blend from Kicking Horse Coffee (www.kickinghorsecoffee.com). It is our first coffee from a Canadian roaster and hopefully not our last. No, we didn’t make it out to British Columbia but we would like to visit there. Especially during hockey season. 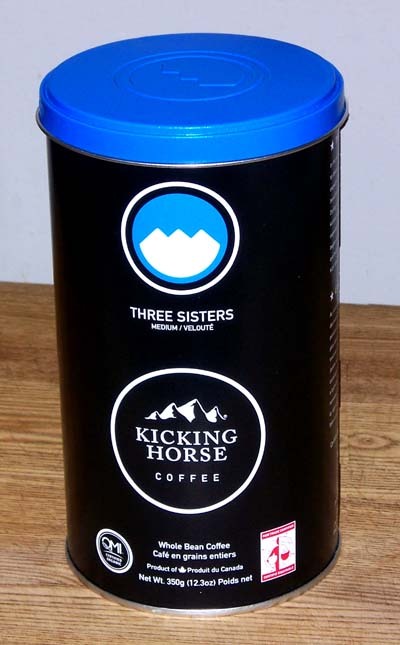 Three Sisters Blend is described as a triple punch of light, medium and dark flavors. They use a medley of Indonesian, Central and South American beans to make up the blend. It is a fair trade, shade grown organic coffee. It comes in a can made of recycled steel. If you live near Kicking Horse you can get the can refilled. They offer a lot of other good sounding coffees and teas. We started with our trusty old auto-drip and there is a sweet, somewhat acidic aroma. I thought it was interesting. There is a spicy taste, almost like pepper to me that hits the front and sides of the tongue. This coffee made me think and I was looking forward to the other brewers. The Chemex coffee maker cleaned up the taste and brought out more of a chocolate undertone. It also toned down or smoothed out the tartness. The coffee seemed less spicy and it tasted better as it cooled. We have started making some extra coffee and letting it cool to taste the flavor profile. The French Press brought out more of the roast flavor and a good aftertaste. That spicy flavor is there, but not so much pepper. It is an interesting taste in this coffee. It had a heavier feel in the mouth but we still think it has a medium body. I tried it a couple of times in the Clever Coffee Dripper and enjoyed each cup. Kim thought it went well with chocolate, cherries and dates and was o.k. with vanilla, cinnamon and almonds. She didn’t like it paired with lemon because it made it too tart. Overall we and our friends liked this Three Sisters Blend. If you are adventurous want to try an intriguing coffee from a Canadian roaster we encourage you to give this one a try. We received this coffee for free and offer objective feedback. Until next time remember to stop and enjoy the coffee and conversations.